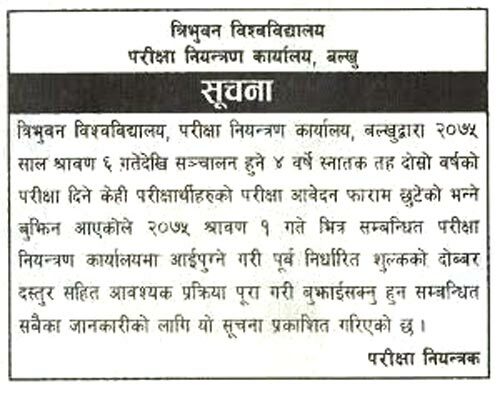 Tribhuvan University, Office of controller of examination, Balkhu has published a notice for students who are yet to submit4 Years Bachelor Level Second Year Examinations application form. Students can submit the form till Shrawan 1, 2075 (July 17, 2018) with double fee. The Second Year Examination starts from Shrawan 6, 2075 (July 22, 2018) onwards.